Every 100 years, Louie’s farm emerges from another dimension into the heart of Times Square – bringing with it tons of alien animals. 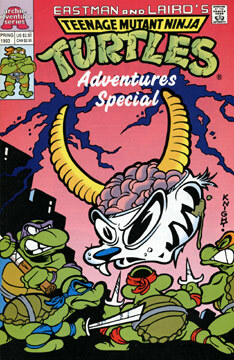 This time, a goat and a moose run off and get mutated after drinking some sewer water – turning them into super-powered, crazed villains. Fortunately the Turtles now reside in NYC and save the day with a little help from their friends.